In "the land a little left of reality," there definitely are angels. 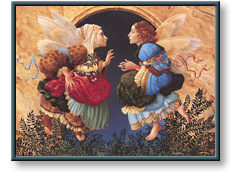 Meet James C. Christensen's Two Angels Discussing Botticelli. Naturally, these heavenly messengers are influenced by the same things as the man who so beautifully depicts them. Like him, they often discuss their favorite artists. Look at their hair, their hands and feet, the background, and the rich colors. You may see the influences of Renaissance artist Sandro Botticelli in this image that is so clearly Christensen's. "These two are honest, genuine angels, who are genuinely admiring of Botticelli," says Christensen. "They're not indulging in fashion trends. He's just their favorite, and they love him." And it's easy to love the beauty and reverence of James Christensen's unique work of art. "Angels are messengers and caretakers. We need angels. The idea that there's somebody who is totally good by nature, who will never betray us, whose task it is to watch out for us, who knows more, sees more, and takes care of us, is a very comforting thought in a world in which we are frequently powerless." by James C. Christensen is prohibited from being copied.